I was first brought to Lotus of Siam by chowhounders back in early 2008. Since then I’ve probably been for lunch at least 5 more times because they have one of my favourite dishes that I refer to as the Crispy Rice Salad. Lotus of Siam is a $28 cab ride from the strip and a $17 cab ride back. The difference in price is always perplexing. On recent trips to Vegas I’ve rented a car with the knowledge that the price of a cab ride to LOS would cover the cost of the rental itself. On this visit, I convinced my brother to join me even though Thai is not his favorite cuisine. I was confident in the knowledge that the flavors of LOS are so amazing, that he wouldn’t regret his decision. I’m not going to go into the details of the who’s and why’s of Lotus of Siam, for that just google yourself. I will mention one thing though, I’ve read a lot of negative things about the service at LOS and in all my visits there, I’ve always had a pleasant experience. 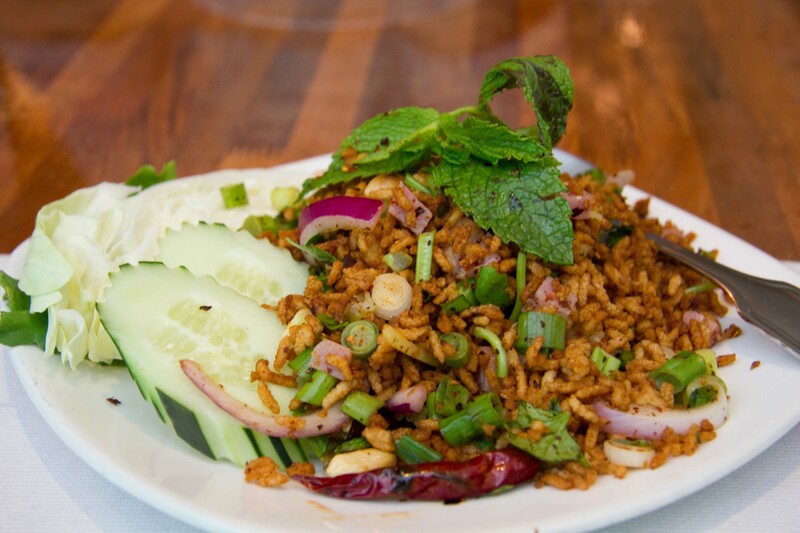 I’ve just updated my About section to add, “Favorite salad – Nam Kao Tod aka Crispy Rice salad from Lotus of Siam in Vegas”. The Nam Kao Tod is crispy rice with minced sour sausage, mixed with green onions, chili, ginger, peanuts, lime juice and fresh mint. The components of this dish create such a happy experience in my mouth. Sour is what first hits your palate, followed by the heat from the chilis, your teeth crunch into the crispy rice and you get an overall feeling of freshness from the large pieces of ginger and mint. I’m happy just writing about it now, or it could be I’m happy in the knowledge that I have a to-go box of Nam Kao Tod to eat for lunch on the plane tomorrow. The cucumber and cabbage add a nice crunch to the salad as well as help take the heat of the chilis away. This dish can be ordered with a varying degree of spiciness from 1-10, I always order a 5 but find that sometimes that’s way too spicy and other times, it’s just right. After the Nam Kao Tod, I really can’t say that I have any other “must have” dishes until I get to dessert. Knowing that my brother is in to all things fried, we went with the Garlic Black Pepper chicken wings. 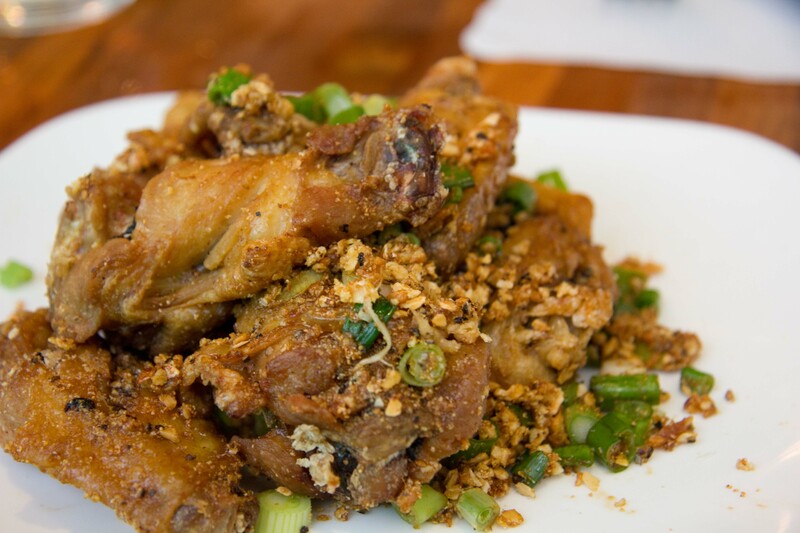 The wings are fried until crispy and are very flavourful. They’re not as good as Phnom Penh’s in Vancouver, but tasty nonetheless, and a lot less greasy. I was curious about the next dish, only because I’d had it at Pok Pok the week before and knew it was one of LOS’s specialties. 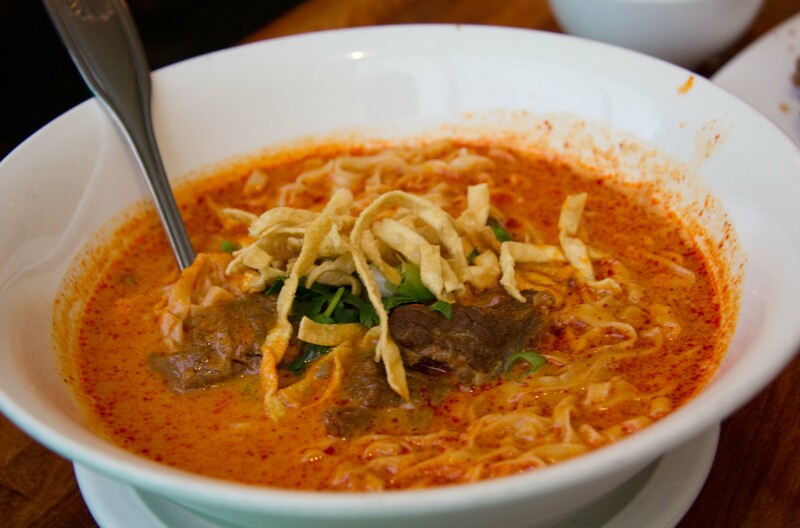 The Khao Soi is a Burmese influenced Northern Thai dish with hand pulled egg noodles in coconut curry cream broth. We ordered it with beef were small tender nuggets and kicked off a fair bit of heat. Although I didn’t think the flavour of the broth was as good as the one at Pok Pok, the noodles were fantastic. This dish was supposed to come with a side of lime, onions and pickled vegetables to add to the broth. I think that would have made a lot of difference to the flavour of the broth. I’m not much of a dessert eater, but I always make sure to save room for the sticky rice with mango. 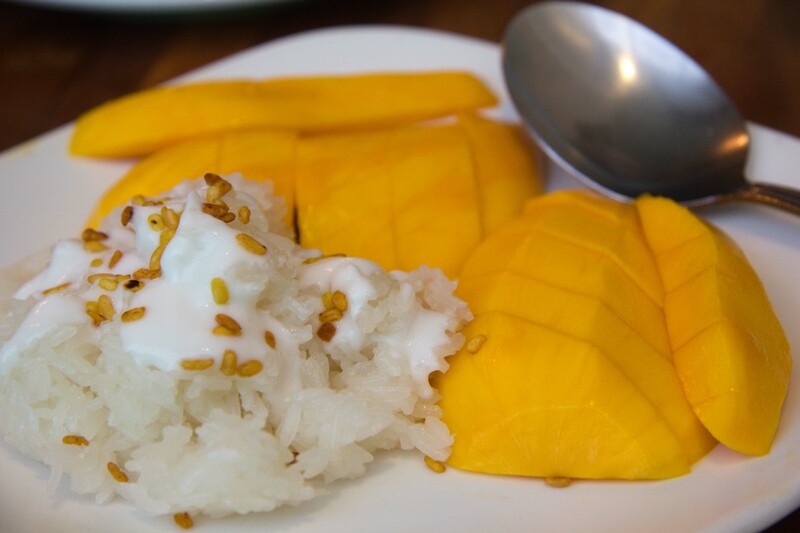 The sticky rice with the coconut cream is both sweet and salty, eaten with the fresh slices of mango and you get one of my favourite desserts ever! There have only been two other restaurants I’ve found that do Nam Kao Tod, one 40 minutes outside of the LA, and one 30 minutes south of Seattle. Both claimed to have a delicious Nam Kao Tod, both times, I’ve been disappointed. I figure if I want to satisfy my craving, I should just go to the source. I’ve had a lot of other dishes on the menu, but have a hard time recommending them. All were good, but really dependant on what you’re in the mood for. The one that stands out is the Short Rib Beef in a Penang red curry. A friend of mine visited sometime last year and had at least 8 dishes in one sitting. Perhaps if she’s reading this, she can remember other dishes to recommend ?